11 pm Update: Hurricane Gustav has emerged into the southeastern Gulf of Mexico after crossing western Cuba. Winds have decreased to 140 mph, but the storm is likely to intensify again over the Gulf. It continues on track to reach the northern Gulf Coast Monday afternoon. The most likely point of landfall is the Louisiana coast west of the Mississippi River. 8 pm Update: At 8 pm, Hurricane Gustav remains an extremely dangerous Category 4 storm as it crosses western Cuba. Maximum winds remain at 150 mph. Some strengthening to Category 5 is possible. The center is located about 65 miles west southwest of Havana, moving northwest at 15 mph. On its current track, it is expected to make landfall on the northern Gulf Coast on Monday as a major hurricane. 5 pm Update: Hurricane Gustav is now a very strong Category 4 storm with maximum winds of 150 mph as it approaches western Cuba. A Hurricane Watch has been issued for a large portion of the northern Gulf Coast, from High Island, Texas eastward to the Alabama/Florida border. A Tropical Storm Watch has also been issued eastward from there along the coast of the Florida panhandle. The eye of the storm was located about 130 miles east northeast of the western tip of Cuba, and the storm was moving northwest at 15 mph. The latest forecast track brings Gustav a little more quickly to landfall on the northern Gulf Coast. The minimum central pressure reported by aircraft reconnaissance is 942 mb. Aircraft reconnaissance has found that Hurricane Gustav is now an extremely dangerous Category 4 storm with maximum winds of 145 mph. A special advisory issued by the National Hurricane Center at 2 pm locates Gustav just east of the Cuban Isle of Youth and 155 miles east of the western tip of Cuba. An unofficial report showed a sustained wind of 140 mph as the western edge of the eyewall reached the Isle of Youth. Minimum pressure is estimated at 945 mb. Additional strengthening is likely, with the storm possibly reaching Category 5 in the vicinity of western Cuba. Hurricane Gustav strengthened rapidly overnight and is now a Category 3 storm with maximum winds of 125 mph. It's approaching western Cuba on a northwesterly path at 14 mph. The current track will bring Gustav into the Gulf of Mexico by early Sunday and to a landfall on the northern Gulf Coast Monday morning. Although the storm's strength is likely to fluctuate crossing Cuba, further intensification is likely in the Gulf. 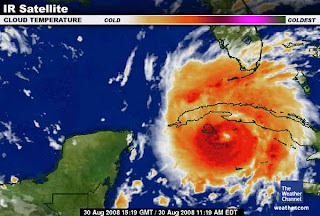 The National Hurricane Center is predicting that Gustav will reach a maximum strength of Category 4. A Tropical Storm Warning is now in effect for the lower Florida Keys, and a Hurricane Warning remains in effect for portions of western Cuba. 11 pm Update: Hurricane Gustav's maximum winds have increased to 80 mph as it moves through the Cayman Islands. As of 11 pm, the center of Gustav is about 25 miles west southwest of Little Cayman Island, moving northwest at 10 mph. Further strengthening is forecast for the next two days. On the third anniversary of Katrina, Hurricane Gustav is developing into a potential major threat to the northern Gulf Coast. Moving westward from Jamaica over some of the warmest water in the entire Atlantic basin, Gustav has re-intensified to a hurricane this afternoon. At 3:15, it was upgraded to a Category 1 storm with winds up to 75 mph, based on aircraft reconnaissance. Gustav is expected to continue intensifying, possibly reaching major hurricane status (Category 3) by the time it reaches western Cuba this weekend. One index of intensification is showing a 35% chance of an increase of up to 30 knots in wind speed during the next 24 hours. At 5 pm, a Tropical Storm Watch was issued for the lower Florida Keys. Various watches and warnings remain in effect for the Cayman Islands, western and central Cuba, and Jamaica. Tropical Storm Gustav is strengthening early this afternoon to near hurricane force. Maximum winds are 70 mph at 2 pm, based on aircraft reconnaissance, and the storm could become a Category 1 hurricane at any time. The storm has also expanded somewhat today; tropical storm force winds extend up to 140 miles from the center. Continued strengthening, possibly rapid, is expected. The latest advisory places the center of Gustav 125 miles east southeast of Grand Cayman, moving west northwest at 11 mph. On its current track, the storm will pass near or over the Cayman Islands today, over western Cuba Saturday, and into the southern Gulf of Mexico Sunday. Tropical Storm Gustav weakened slightly overnight from its encounter with Jamaica, but it is now moving away from the island and is expected to strengthen today, possibly rapidly. Maximum winds at 11 am were at 65 mph. The center of the storm was located about 165 miles away from Grand Cayman Island and headed in that direction at 8 mph. A Hurricane Warning has been issued for portions of western Cuba and a Tropical Storm Warning is in effect for central Cuba. Gustav will be moving over very warm water in the northwestern Caribbean under favorable upper level conditions, so it is very likely to become a hurricane some time today. It could even become a major hurricane by the time it reaches western Cuba. 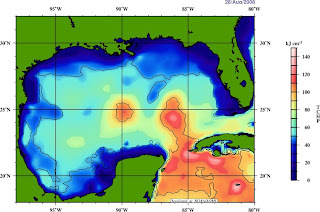 One intensity model gives a 28% chance of an increase in strength of 30 knots or more in the next 24 hours. There is still wide disagreement among models on the final landfall point, so all interests in the northern Gulf of Mexico should remain alert. Tropical Storm Hanna is somewhat disorganized as it passes north of the Leeward Islands. Maximum winds are 50 mph as of 11 am. Gradual strengthening is likely with the storm possibly becoming a hurricane by the middle of the weekend. After opening higher, natural gas prices are up a little less than 2% in mid day trading. WSJ Environmental Capital reviews yesterday's counterintuitive energy price action. Late PM Update: Gustav is still a strong Tropical Storm as it moves westward along the south side of Jamaica with maximum winds of 70 mph as of 11 pm. There is still wide disagreement among models on the storm's intensity, but it is expected to be a major hurricane as it crosses the Gulf of Mexico. Hanna has strengthened to 50 mph this evening; it's expected to become a hurricane by Saturday. 8 pm Update: The center of Tropical Storm Gustav is now near the south coast of Jamaica, about 15 miles west of Kingston. Movement is toward the west at 7 mph, and maximum winds are still 70 mph. A Hurricane Warning is now in effect for the Cayman Islands, and the warning for Jamaica remains in effect. Update: Added wind probability chart, link to Jamaica Gleaner. Tropical Storm Gustav continues to bear down on Jamaica late this afternoon after making landfall on the eastern tip of the island around 2 pm. Maximum winds are still at 70 mph. As of 5 pm, the center of Gustav is located only 15 miles east northeast of Kingston. It's moving west around 6 mph. 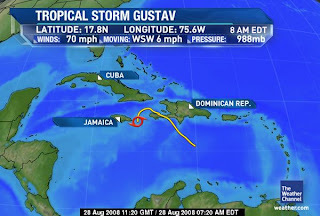 IT IS SIMPLY IMPOSSIBLE TO DETERMINE EXACTLY WHERE AND WHEN GUSTAV WILL MAKE FINAL LANDFALL. IN FACT...TAKING INTO ACCOUNT THE UNCERTAINTIES IN TRACK...INTENSITY...AND SIZE FORECASTS...THE CHANCES OF HURRICANE-FORCE WINDS WITHIN THE NEXT FIVE DAYS ARE ESSENTIALLY THE SAME AT EACH INDIVIDUAL LOCATION FROM THE FLORIDA PANHANDLE COAST WESTWARD THROUGH THE ENTIRE COASTLINE OF LOUISIANA. The bottom chart on the right shows that, between Gustav and Hanna, there is at least a 5% chance of tropical storm force winds in the next 5 days along the entire Gulf Coast and along the Atlantic Coast as far north as North Carolina. This means that interests along the entire western and northern Gulf Coast need to keep a close eye on this storm. The governors of Louisiana and Texas have already issued disaster declarations in order to facilitate storm preparations. The Jamaica Gleaner reports on how Jamaicans are preparing for the storm in their own unique way. Tropical Storm Hanna continues to maintain minimum strength of 40 mph as it moves west northwest and then northwest away from the northern Leeward Islands. Are We Prepared for Gustav? Early PM Update: Tropical Storm Gustav, still just below hurricane strength, is bringing heavy rain to Jamaica. At 2 pm, the storm was around the eastern tip of the island, about 40 miles east of Kingston. It's moving to the west at 5 mph and is expected to continue on that course with some increase in forward speed the rest of today. A reconnaissance flight is currently measuring conditions near and around Gustav. Tropical Depression 8 has just been upgraded to Tropical Storm Hanna with maximum winds of 40 mph as of 11 am. It's located a little over 300 miles northeast of the northern Leeward Islands and moving west northwest at 12 mph. Hanna is expected to gradually reach hurricane force as it moves northwestward and then more westward, possibly threatening the Bahamas or Florida later on. Tropical Storm Gustav remains just under hurricane force as it moves westward toward Jamaica and then the Cayman Islands. Maximum winds are 70 mph, and the forward speed is around 5 mph. 9:30 am Update: Tropical Depression 8 (Tropical Storm Hanna wannabe) is looking much more impressive on satellite imagery (shown to the right) in the last couple of hours. 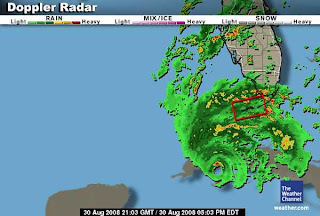 Late last evening, one of The Weather Channel meteorologists was saying, "Don't pay attention to that blob to the south, that's not Gustav." 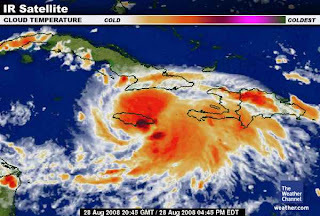 The disruption caused by interaction with land can cause tropical cyclones, especially weak ones, to reorganize, and that's essentially what has happened to Gustav. It's looking a lot healthier today after regrouping to the south of its original track. The new course is likely to take it over or even to the south of Jamaica. After weakening to as low as 45 mph, Tropical Storm Gustav is regaining strength this morning and is now up to 70 mph. The storm is likely to be back to hurricane force later today. Its restrengthening and the more southerly track have prompted a Hurricane Warning to be issued for Jamaica. 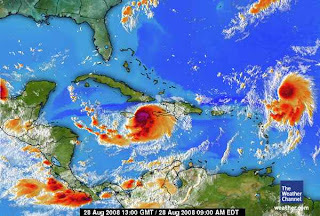 At 8 am, the storm was located about 80 miles east of Kingston, Jamaica. It was nearly stationary, but expected to resume a west southwest motion. The official forecast has now moved more to the west, but it still brings Gustav into the Gulf of Mexico as a Category 2 hurricane. Meanwhile, as the possibility was noted last night, Tropical Depression 8 has formed east of the Leeward Islands. It has the potential to become Tropical Storm Hanna later today. On its current path, it will move well north of the islands, but a turn to the west could possibly threaten the Bahamas or Florida later on. 8 pm Update: Tropical Storm Gustav has weakened slightly again this evening; maximum winds are now 45 mph as it moves west around 7 mph. The current position is 65 miles south of Guantanamo, Cuba. Slow strengthening is still expected. Meanwhile, as all the attention has been focused on Gustav, a low pressure area which has made its way to a position about 375 miles east northeast of the northern Leeward Islands has shown high potential for development. It could become a tropical depression as early as tonight or tomorrow. If it develops further, it would become Tropical Storm Hanna. Later PM Update: Showing the limitations of intensity forecasting, even at short time scales, Tropical Storm Gustav has weakened further this afternoon from its interaction with Haiti. A reconnaissance flight has found that maximum winds at 5 pm are down to 50 mph. It has also slowed to a forward speed of only 3 mph, which should delay its reintensification. Conditions are very favorable for strengthening, and it is likely to be back to hurricane force south of Cuba by late tomorrow or Friday. However, there is still a wide disagreement among intensity models. After an early jump based at least in part on news of the storm, natural gas prices have closed somewhat lower, but still up 2.7% for the day. PM Update: Cuban radar early this afternoon, displayed to the right, is showing Tropical Storm Gustav's center of circulation moving away from the southwestern tip of Haiti. At 2 pm, the center was about 90 miles east southeast of Guantanamo, Cuba, moving west at 5 mph. The forecast track remains virtually identical to the one in the previous advisory. Maximum winds are still at 60 mph, but the storm is likely to regain hurricane strength in the next day or two. Natural gas prices have eased from their opening highs; they are now up a little more than 2%. 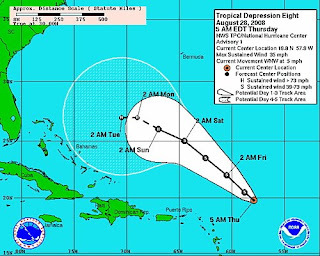 Tropical Storm Gustav is gradually moving away from Haiti today. The storm weakened from its interaction with the mountainous terrain of Haiti overnight, and the maximum winds are now 60 mph. High-resolution satellite and Cuban radar images show that the storm is again becoming better organized, however. THERE IS VERY LITTLE...IF ANY...SKILL IN INTENSITY PREDICTIONS AT THESE EXTENDED RANGES. INDEED...IF ONE LOOKS AT THE LATEST WIND SPEED PROBABILITY PRODUCT INCLUDED IN THIS PACKAGE...IT CAN BE SEEN THAT THERE IS NEARLY AN EQUAL CHANCE THAT GUSTAV WILL BE A CATEGORY 1...CATEGORY 2...OR CATEGORY 3 HURRICANE AT THE END OF THE FORECAST PERIOD. Despite the uncertainty, energy markets have continued to react to the threat. Natural gas prices rose over 4% this morning for a 2-day gain of about 10%. Late PM Update: Earlier this evening, Cuban radar showed a well-defined eye for Gustav, but later radar and satellite imagery pictured a more ragged structure, so the storm was downgraded to a tropical storm at 11 pm. Maximum winds are still estimated at 70 mph, and restrengthening is likely tomorrow as the storm moves more over water. There has been little change in the forecast track, which takes Gustav between Jamaica and southeastern Cuba by Thursday. At that point, it could reach as high as Category 2, and the official forecast brings it to near Category 4 at 72 hours (Friday night). 8 pm Update: Maximum winds for Hurricane Gustav remain at 75 mph as of the latest advisory. The center was located about 60 miles west of Port Au Prince, Haiti and about 155 miles southeast of Guantanamo, Cuba. Some fluctuations in intensity are likely tonight, but it should strengthen again as it moves back over the water of the Windward Passage tomorrow. As shown in the second chart on the right, Gustav will be moving over an area with some of the highest Tropical Cyclone Heat Potential (TCHP) in the Atlantic basin. 5 pm Update: Hurricane Gustav has weakened over southwestern Haiti to 75 mph. It may weaken further to below hurricane strength overnight before moving back over water east of Cuba. The upper level environment is also favorable for development, with very low wind shear. 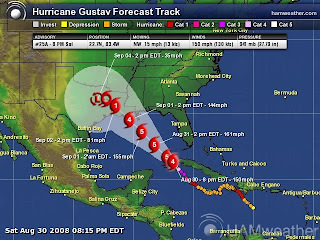 Gustav is moving toward the northwest at a little slower pace, about 10 mph. Jeff Masters reports in his blog that Gustav tied the record of Humberto from last year for the fastest time from initial advisory to Category 1 hurricane. Natural gas prices ended trading slightly down from their highs, but still up 5.3% for the day. 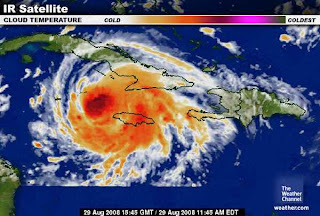 Hurricane Gustav made its first landfall on southwestern Haiti early this afternoon. The storm is still at Category 1 strength with maximum winds of 90 mph. Some weakening is likely from the interaction of Gustav's relatively small circulation with Haiti, but then restrengthening is expected over the warm waters between Haiti and southeastern Cuba. There is a large uncertainty in position and intensity after day 3, but the official track takes the storm over the far western tip of Cuba and into the Gulf of Mexico by this weekend. Gustav's potential threat to the Gulf is helping to keep natural gas prices near the high for the day, up 6.6%. In other tropical news, Stu Ostro does his usual thorough and colorful job of reviewing "Fay's nine lives" at The Weather Channel blog. Update: As of 11 am, Hurricane Gustav remains at 90 mph strength. A Hurricane Warning has been extended to eastern Cuba. Based on the expected intensification and track heading into the Gulf of Mexico, oil prices are higher in this morning's trading, and natural gas is up over 6%. As expected, Tropical Storm Gustav continued to strengthen overnight, becoming a Category 1 hurricane. By 8 am, maximum winds were 90 mph, and further strengthening to Category 2 is possible before Hurricane Gustav makes landfall on southwestern Haiti today. The current movement is toward the northwest at 9 mph, but a turn to a more westerly track is forecast. This will keep the storm more over very warm water, which should lead to further intensification. The official intensity forecast has Gustav becoming a major hurricane (Category 3 or higher) in the northwestern Caribbean within a few days. Tropical Storm Gustav has strengthened through this evening; it now has maximum winds of 70 mph. Hurricane warnings have been extended in Haiti and a Tropical Storm Watch is now in effect for Jamaica. The National Hurricane Center (NHC) notes that Gustav now has a "well-defined eye." NHC expects that the next aircraft reconnaissance at 2 am will find that the storm has become a hurricane. The track still remains somewhat uncertain, but the official forecasts have been moving more westerly than northerly, giving the storm more time over water. This would imply a greater strengthening. Two major models, in fact, are keeping Gustav away from most of Cuba and increasing it to major hurricane force within 5 days. 5 pm Update: Although the appearance of Tropical Storm Gustav has become somewhat ragged during the day, maximum winds are still 60 mph at 5 pm, based on the latest aircraft reconnaissance data. Movement is toward the northwest at 14 mph; the storm is expected to be near or over Haiti during the day tomorrow. There is still significant uncertainty in the track, and the latest official forecast brings Gustav more to the west and over Cuba. PM Update: At 2 pm, the National Hurricane Center began issuing advisories on Tropical Storm Gustav. Maximum winds are already around 60 mph, and some strengthening is likely in the next 24 hours. Hurricane watches and warnings have been issued for major portions of the southern coasts of the Dominican Republic and Haiti. Whatever this tropical season lacks so far in sheer number of storms or in extreme intensity, it's making up for in persistence. Fay's long reign as a tropical storm came to an end late Saturday evening when it was downgraded to a tropical depression, but its rains have continued. 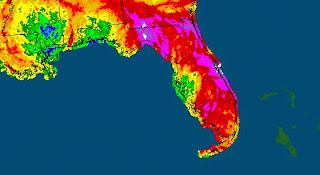 As the 7-day precipitation map shows, nearly the entire state of Florida except for the western panhandle was drenched with torrential amounts of precipitation. As the center of the remnants continued to move through east central Mississippi this morning, heavy rains were rotating into that western panhandle area as well. Flash flood watches are in effect for that portion of Florida, as well as parts of Alabama, Mississippi, and eastern Louisiana. Flood warnings are in effect in areas of northern Florida and southern Georgia. Meanwhile, an area of storms which had persistently tracked westward into the central Caribbean was looking very impressive on satellite imagery today. It has now become Tropical Depression 7, and it could develop into Tropical Storm Gustav if data from aircraft reconnaissance this afternoon provide support for that interpretation. According to the Tropical Atlantic recon decoder, peak surface winds were estimated a few minutes ago as high as 41 kt. (47 mph). A stormy area which moved westward into the central Caribbean has become better organized this morning. It has now been designated as Tropical Depression 7. Satellite images have shown well-defined curved bands of convection and the possible development of an eye. If aircraft reconnaissance confirms the impressive appearance of this feature, it could become Tropical Storm Gustav later today. At this point, there is considerable uncertainty in the track forecast, but the official path takes what would then be Gustav at tropical storm strength to the northern coast of Cuba by Friday.